When you host your destination wedding in beautiful Los Cabos, you and your family will enjoy the warm weather, sunny beaches and world-renowned hospitality for which Mexico is famous. And when you hire Suzanne Morel Face and Body Care to do your bridal hair and make-up, our attention to detail and personalized services will surpass every expectation you might have of a bridal beauty team anywhere! Cabo bride Amber recently got married at Villa Serena, a gorgeous beachfront private villa in the Corridor area of Los Cabos. Our professional bridal styling team went on-location to help Amber look and feel her very best for her wedding day on the beach! We styled Amber’s long blond locks into a loose, beachy down-do. Her floral crown was certainly the focal point of this natural, ethereal bridal look. We kept her make-up dewy and fresh—the perfect bridal style for this Cabo beach wedding. 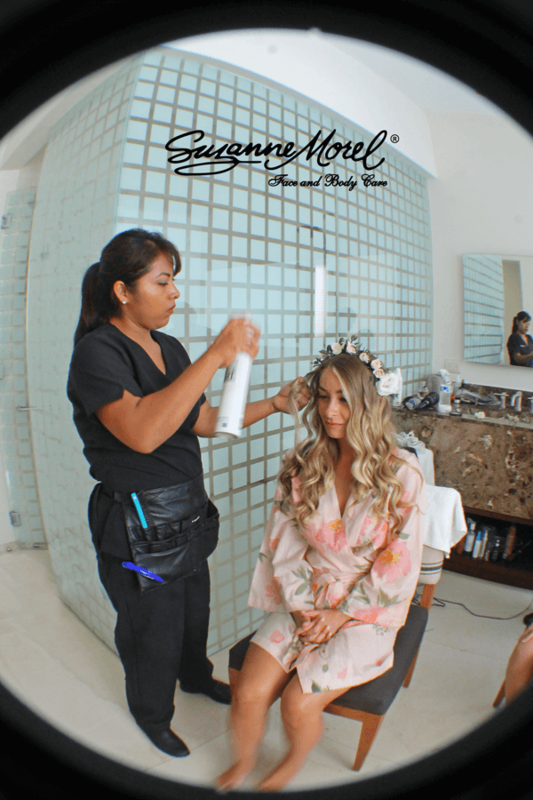 Whether you’re hosting your Cabo destination wedding at a private villa or one of the many beautiful local resorts, Suzanne Morel Face and Body Care can deliver the bridal look of your dreams! Our team extends a sincere thank you to Amber and all of the beautiful brides who trust Suzanne Morel Face and Body Care with their most special day. This entry was posted in Cabo Bridal Hair and Makeup and tagged beachy Cabo bridal style, Cabo beachy hair and makeup, Cabo bridal down do, Cabo bridal hair and makeup, Cabo bridal salon, Cabo mobile salon, Cabo private villa, Cabo professional stylists, Cabo salon on location, Cabo wedding hair and makeup, Cabo wedding professionals, Cabo wedding salon, Cabo wedding vendor, happy Suzanne Morel brides, Mexico private villa wedding, Suzanne Morel, Suzanne Morel experience.